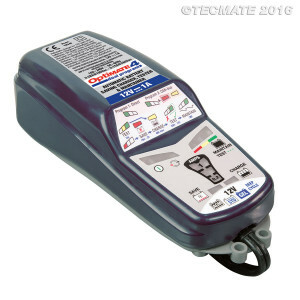 First introduced in 2008, TecMate’s OptiMate 4 quickly became established as one of the most popular battery chargers in their line-up. Version 2, introduced in 2010, had two major updates – high frequency, fully electronic power conversion (able to receive global 100 – 240Vac power) and a dual program feature. Program 1 gave direct charging to a 12V battery via the battery clips or permanent battery leads with M6 (1/4”) rings; program 2 allowed charging to be activated through the CAN bus controlled 12V power port on BMW motorcycles. The OptiMate 4 dual program was the first to solve the problem of the BMW rider periodically having to turn on the key to re-activate their battery maintainer to prevent their battery running down; OptiMate 4’s keyless program communicated seamlessly with the BMW CAN bus control and guaranteed 24-7 maintenance without the need of supervision. The keyless entry and additional features, such as the ability to save a battery from as low as 0.5V and preand post-charging testing (allowing the user to monitor charge progress), quickly made OptiMate 4 dual program the most popular and trusted charger in global powersport. The new Version 3 retains all these advantages and more. The more efficient power circuitry (California approved) now delivers 1 Amp of charge current and refinements in the software control further speeds charging – with the visual LED instructions on the charger itself helping keep the user informed of charge progress at a glance. Two models of the Version 3 are available – the standard V3 OptiMate 4 model and a dedicated BMW CAN bus edition.